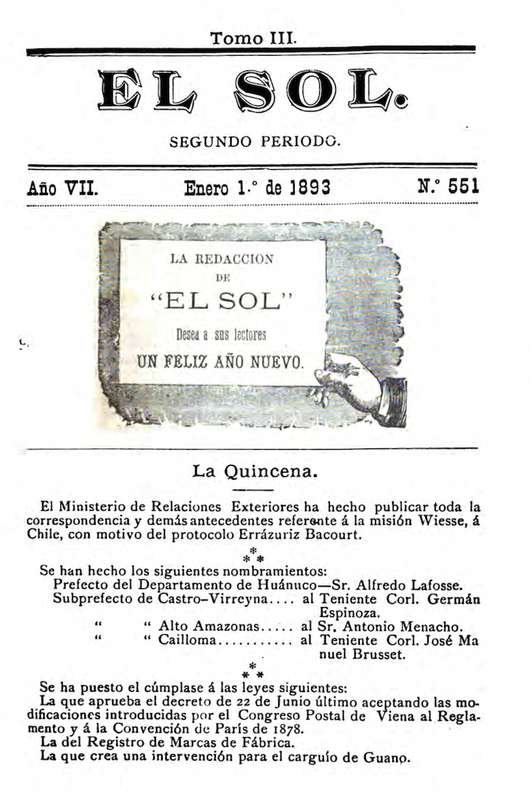 Revista Quincenal de Historia, Magnetismo, Estudios Psiquicos. Lima, Peru. Language: Spanish. Editor: Carlos Paz Soldan. 1/1, May 26, 1886. 8pp. Originally a general purpose journal of news and comment, the journal gradually added spiritualism, mesmerism and parapsychology to its repertoire. It was still in existence in May 1900 when it published a long expose of the frauds of Alberto Sarak, Conde de Das. Exchange in Ubersinnliche Welt, 1893. Crabtree 1477 incorrectly says the journal was published only in one volume in 1900. National Library of Canada; UCLA; National Library of Medicine; University of California, Los Angeles; University of Notre Dame; Stanford; etc.